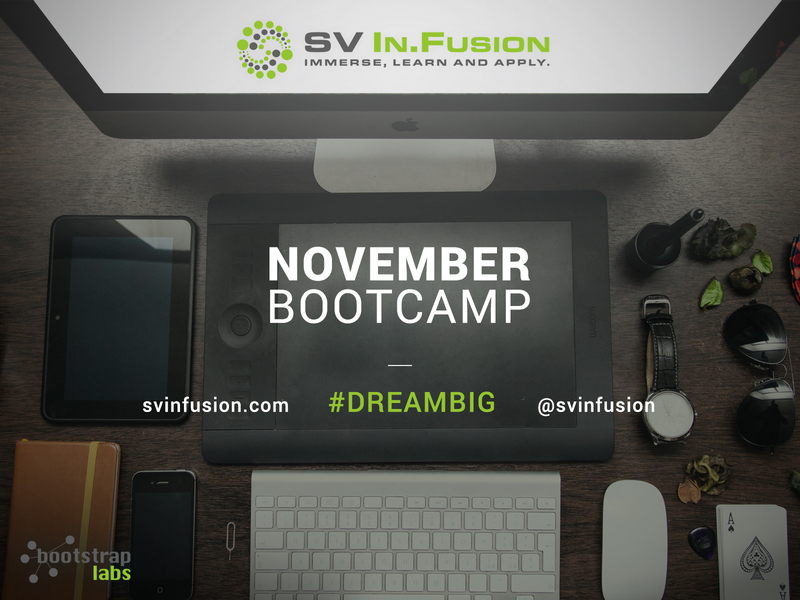 The SV In.Fusion team is glad to announce that the next Bootcamp starts the 3rd of November, 2014! Share Silicon Valley’s startup culture & best practices with foreign founders in order to increase their chances of success, accelerate their local ecosystem development, and create jobs & wealth globally. SV In.Fusion is currently interviewing candidates for the next Bootcamp. All qualified candidates are reviewed by BootstrapLabs for the final decision. SV In.Fusion contacts final candidates to announce the next bootcamp class! Participants can start to #DreamBig !!! If you would like to learn more about the SV In.Fusion Bootcamp please check our past blog posts. The SV In.Fusion Bootcamp is supported by top leaders and technology companies. Good luck with the applications and please don’t hesitate to contact us with any questions. CK, what do you think about the bootcamp program so far? We’ve learned a lot, especially through the collaboration with the mentors. They’ve not only given us high-level concepts but also helped us relate to our experiences back in Malaysia and how we can improve the startup ecosystem back home! What are your takeaways from your first week? We’ve met quite a few mentors, among others Stephen Forte from Telerik, with the Masterclass “Lean startup” that I thought was very interesting. We learned that it’s really important to start measuring the growth early on. At Shoppertise, we’re doing e-commerce and so we’ve learned different ways of measuring. A perfect class and learning for our company! What’s next on the agenda? We’re participating in a hackathon this weekend and I hope to meet a lot of geeks (just like me! ), I feel very excited! Chern, how has your experience been with our startup program so far? I’m very grateful to be able to participate in this program and the invitation from BootstrapLabs. The experience has been great, everyone has been very generous and giving, so we’ve been learning a lot – especially from the mentors, who shared with us a little bit about what the Silicon Valley experience is about. What are your takeaways from the first week? Not to think too much about doing something but to go ahead and do it. And be very truthful and honest about your expectations. What are you looking forward to during the last few days? Do more networking on the entrepreneur level, meet entrepreneurs and hear their stories. Vilashiny, what have you learned attending the bootcamp, so far? This experience has been very beneficial for our company, to see the difference between how things are done in Malaysia and in Silicon Valley. For example the pith deck, the quality of content, how to communicate. The startup community in Malaysia is growing and there are many things that we are picking up over here. What kind of feedback have you received? We’ve gotten a lot of feedback, for instance in our pitch deck today for the investors, we learned that we needed more details in the presentation. I look forward to learn more, to get more feedback, to network with more people and exchange ideas with developer and partner networks over here. “Bringing Seoul to the Valley”, the beGLOBAL 2014 conference, was held on Sep 12, 2014 at the InterContinental Mark Hopkins hotel in San Francisco. As an Executive Sponsor, BootstrapLabs offered one lucky Korean team a complimentary 2 week Startup Bootcamp for 2 people provided by SV In.Fusion. The winning team was selected based on its ability, desire to learn, and potential benefit for their business to be immersed in Silicon Valley for the duration of the Bootcamp. Congratulations to Swizzle! We are looking forward to working with you in Silicon Valley very soon. Swizzle (swizzle.fm) is a Social Jukebox for parties that makes music sharing much easier by creating collaborative playlists among friends with YouTube music videos. “I’m so excited to participate in this great program operated in the core of Silicon Valley. I expect to learn more about Silicon Valley entrepreneurship and improve our product quality dramatically with the 2 weeks intensive course.” says Ian Inyoung Lee, the CEO of Swizzle. 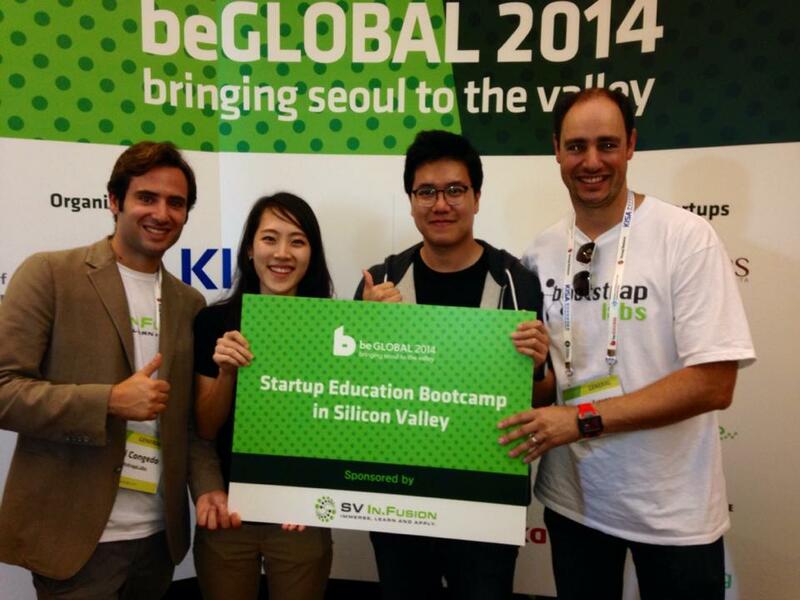 BootstrapLabs was proud to support this year’s beGLOBAL and looks forward to supporting beGLOBAL 2015. The founders of BootstrapLabs remain committed to investing in Korean startups and helping them go global. beGLOBAL is the annual Global Tech Conference with a Korean touch, organized by beSUCCESS (the Korean version of TechCrunch) and sponsored by the Ministry of Science, ICT and Future Planning and KISA (Korea Internet Security Agency). beSUCCESS also organizes beLAUNCH, the top startup conference in Korea, bringing together the best of Tech from the East and West. beGLOBAL was launched last year to connect Korean startups to Silicon Valley and help them enter the global market by attracting foreign investments. K-Startups had a chance to pitch their products and services in front of high profile, local institutional and strategic investors such as Kevin Hale (Partner at Y Combinator), Christine Tsai (Managing Partner at 500 Startups), Matt Kaufman (CEO of CrunchBase), Kevin Scott (Managing Director of Silicon Valley Bank) and many others. William H. Draper, III General Partner, Draper Richards LP shared his insights on the future of global investing during the Fireside Chat. He is one of America’s first venture capitalists, the founder of several leading firms (including Sutter Hill, Draper Richards and Draper International) and the first Silicon Valley VC to invest globally. Mr. Draper, a veteran of the Korean War, has strong ties to Korea. Kevin Lin, Co-Founder and COO of Twitch (acquired by Amazon for $970M), shared his story about founding and growing the world’s leading video platform and community for gamers. Since graduating from Yale in 2004, Kevin has worn a variety of hats. In 2008 he joined Justin.tv as COO, where he was instrumental in the launch of its Twitch platform, attracting the site’s larger partners and other activities that helped grow the Twitch brand. Ben Huh, CEO of Cheezburger Network & Co-Founder of Circa, has been called one of the 100 most creative people in the business by Fast Company and one of the top 10 virologists by the Daily Beast. The Cheezburger Network, founded in 2007, has been credited with bringing Internet memes to the mainstream and popularizing Internet culture. Ben credits the success of his company to the users and fans who create the content. His goal is to make the world happy for 5-minutes a day. Jorn Lyssegen, CEO & Founder of Meltwater Group, founded his startup in Oslo in 2001, moved the HQ to Silicon Valley and bootstrapped it all the way to over $100 million in revenues without taking any venture capital. In 2008, he started the Meltwater Entrepreneurial School of Technology (MEST) and the MEST Incubator in Ghana. The School and Incubator provide training, investment and mentoring for aspiring entrepreneurs with the goal of creating globally successful companies that create wealth and jobs locally in Africa. Graduates of the program have pitched at TechCrunch Disrupt and been part of the 500 Startups accelerator. BootstrapLabs is a Global Technology Venture Investment Company for Global Entrepreneurs. Since 2009, BootstrapLabs has invested in foreign born startups such as Prezi, Witsbits, AudioDraft and Zerply, facilitated their relocation in Silicon Valley to build global companies, while maintaining their roots in their countries of origin to access local talent. Today these startups are valued at $500M+, employ 250+ people and have raised over $25M of follow-on funding from Angels and VCs in Silicon Valley. SV In.Fusion offers a hands-on two week Startup Bootcamp for foreign founders in Silicon Valley taught by experienced local experts. Learn and apply the best tools, techniques & trends Silicon Valley entrepreneurs use everyday to building lean and mean startups! The bootcamp format includes Master Classes taught by experts, immediately followed by Workshops to implement new learnings, and includes a series of immersive activities in Silicon Valley culture – visiting top tech company campuses and meeting with product people, socializing with local entrepreneurs, angels and VCs, stopping by well known coffee shops and diners, as well as visiting city (and geeky) landmarks and museums, local university campuses, etc. SV In.Fusion, in partnership with BootstrapLabs, works directly with foreign startups, their investors, incubators, accelerator, co-working space partners, NGOs and Government agencies around the world to facilitate and accelerate the sharing of Silicon Valley best practices. Week 2 for our five companies from Malaysia started on Monday with a Master Class titled “Startup Financing” led by Rebekah Wu, founder of Right-Hand Partners, a VC relations company. She left the entrepreneurs with plenty of “Do’s & Don’ts”, tips and good advice about making presentations to investors. They learned that “a demo speaks louder than 1000 slides”. And what not to say during that all important VC meeting. What’s the payback time per customer? Do your initial customers continue using your product? What percentage do you lose? Why? Are your target customers ready to adopt a solution like the one you are proposing? How did you come up with your pricing? What are your margins? Most of teams had at least some of the answers ready and everyone learned where they needed to tighten up their pitches. Zach’s overall feedback was that all of the teams need to be prepared to discuss their competition. He said “it’s ok to be in a competitive space if you have a better solution, but it makes investors nervous to not see a thoughtful competitive landscape”. Valuable feedback and good lessons today – Tuesday the teams are offsite, with a breakfast to discuss recruiting, followed by development workshops at Amazon.com and Salesforce.com. We’re checking in to see how the bootcampers are doing this week! How was your first pitch here in the US? – I was the first to pitch, and so I felt quite nervous. I learned a lot from Ben (Levy) and Luigi (Congedo) as they helped me see what I need to improve. What are your expectations about the SV In.Fusion Bootcamp? – I hope I will be able to learn from and connect with other startups in Silicon Valley. I hope that can help us open our mindset to become a global company. – It went well, I was kind of nervous but I’m glad I got it done just in time. What are your expectations about this bootcamp? – I hope to learn how startups actually work, this is knowledge that is easily not accessible in my country Malaysia, so I hope to learn as much as possible and to get to know friends. What is most exciting on the schedule this week? – Most of the program is really exciting but I’m most excited about going to Google, since is one of the largest companies nowadays and I’m sure I can learn a lot from the visit. What are your expectations about this bootcamp and the week to come? – I have been looking forward to this for a long time and so I’m very excited, and most of all I’m looking forward to the trip to Google. 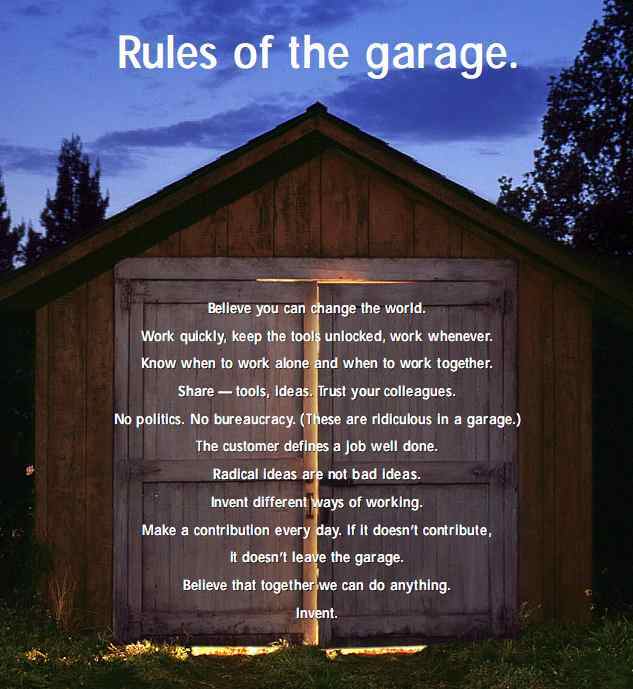 I want to understand how they motivate their employees to work better, and also their journey; how they started out in a basement and then grew to the gigantic technology company they are today. We want to immerse our participants into the Silicon Valley culture by meeting local entrepreneurs, angels and VCs, stopping by well known coffee shops and diners as well as visiting city (and geeky) landmark and museums, local university campuses, technology company tours and dedicated sessions about the Silicon Valley mindset! During one of the sessions of the SV In.Fusion September Bootcamp our participants had the opportunity to learn some of the most important values, historical stories and best practices of the Silicon Valley culture! Thanks to our rockstar mentor Dr. Karine Schomer during the Master Class “Cultural Tips & People Skills to Succeed in the US” our Malaysian entrepreneurs improved their pitches and learned how important is to share with the community to create positive synergies! Sharing, asking for feedback, meeting competitors and experts, hosting events and attending conferences, inventing and finding new ways to work are only some of the very important values and tips we learned during this amazing master class. In order to spread the Silicon Valley mindset and culture, during and after each Bootcamp, SV In.Fusion will share advice, tips and important information in order to support foreign founders and help other local ecosystems to succeed! DON`T FORGET TO SIGN-UP FOR UPDATES FROM SV IN.FUSION!! Our SV In.Fusion Bootcamp was off to a great start this week with a group of startup companies from Malaysia. The Malaysian companies taking part in this two week Startup Bootcamp have a jam-packed schedule that started in San Francisco on Monday. The companies practiced their pitches for the first time in the US, and were then given valuable feedback, with the goal of improving their pitches to perfection by the end of the bootcamp. On Monday, they also got a crash course in how to succeed in Silicon Valley from a cultural and people skills perspective given by Dr. Karine Schomer. Day one: Malaysian entrepreneurs at the 2-week Silicon Valley bootcamp. Yi Jun, CEO at Splory.my. Mugilan Chitambram, founder of Targetzen. BootstrapLabs co-founder Ben Levy gives the entrepreneurs valuable feedback. Dr. Karine Schomer talks about Silicon Valley culture. Each Master session is followed by a workshop. Picture of the day: SV In.fusion selfie!!! 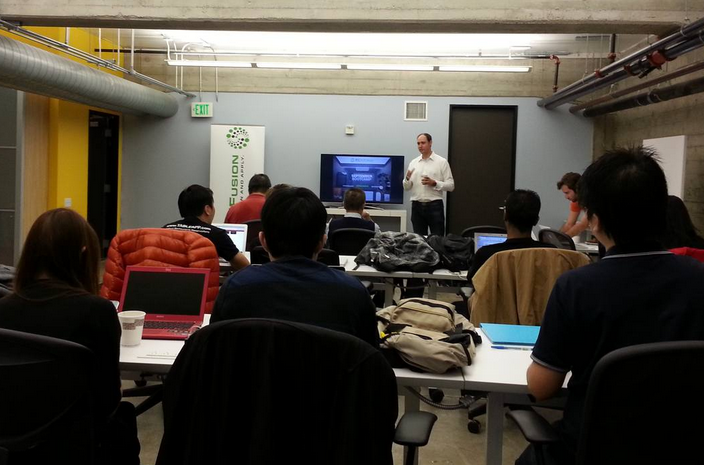 Thanks to the support of BootstrapLabs, in only a few weeks SV In.Fusion was able to organize one of the most exciting and innovative Startup Bootcamps in San Francisco. During the program founders from different countries will have the opportunity to learn and apply the best tools, techniques & trends Silicon Valley entrepreneurs use every day to building lean and mean startups! SV In.fusion is proud to introduce the startup participants for the upcoming SV In.Fusion Startup Bootcamp! Targetzen founders have more than 10 years experience in the Advertising space and a proven track record at delivering industry-leading results for their customers. The team has recently launched a Facebook Intelligence Audience Targeting software with proprietary algorithms that allows companies or brands to monitor, listen and understand their social media fans, capture and target the right niche market and increase their media budget performance on social media. Net2ads online-to-offline (o2o) hardware and cloud-based software solution transforms any existing POS system into a smart hyperlocal Ads delivery platform by enabling business owners, employees, 3rd party agencies or Net2ads’ dedicated network of designers, to quickly and easily create innovative and real time ads campaign delivered to each paid customer in the form of a customized print receipt. Shoppertise allows anyone with a mobile phone to sell online professionally in three easy steps: Snap, Share and Sell. The company wants to empower SMBs across South East Asia (and beyond) to sell professionally online without any additional cost, skills or headache; its simplicity makes Shoppertise the best online selling solution for SOHOs and SMBs and provides its premium members with exciting features like Advertising, Pick-up & Delivery, Professional Photo Shooting and Blog Integration. Splory is a dead simple but smart mobile application that lets you organize and manage get-togethers with friends or colleagues on the fly, while suggesting relevant places to meet or things to do based on intent and location. Additionally, the platform aims at building an interest social graph where users can discover and connect with other people that share similar interests, activities or experiences. Introducing SV In.Fusion Startup Bootcamp!